The DCEU has always fared better with its solo movies than its team-ups. 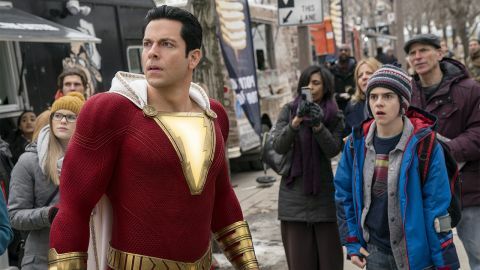 And so it resoundingly proves with Shazam!, an adaptation of one of its lesser known characters in a determinedly small and contained standalone. It’s one of the most irresistibly likeable superhero films in ages. An obvious point of comparison is Marvel’s Guardians of the Galaxy, as Shazam! takes a second-tier property and makes it look like it could never have been anything but a home-run smash with tons of humour and heart, and a charming manchild hero. In this case though, it’s quite literally a manchild hero… Billy Batson (Asher Angel) is a 14-year-old kid who has bounced from foster home to foster home across six counties. He’s always on the run, searching for the mum he was separated from as an infant. He’s told, as he’s placed with his latest foster family in Philadelphia, that he’s been wasting his time “looking for someone who never looked for you”. Billy’s homed with the impossibly nice Rosa and Victor Vasquez (Marta Milans and Cooper Andrews) and their adopted clan, but he’s still drawn to trouble, and his absent mum. All of which leads to him being brought to the Rock of Eternity – presided over by a beardy wizard (Djimon Hounsou) – and gifted with superpowers. Billy just has to say the magic word (“Shazam!”, the name of the wizard) and he’s transformed into an adult superhero (played by Zachary Levi) with a full spectrum of powers. Meanwhile, there’s a villainous origin story underway for Dr. Thaddeus Sivana (Mark Strong), who’s on his own quest for power. Disturbed by his newly unrecognisable spandex-clad body, the only person Billy can turn to is foster sibling Freddy Freeman (Jack Dylan Grazer), a superhero fanboy who collects Batman, Wonder Woman and Supes memorabilia (the events of Batman v Superman: Dawn of Justice and Justice League having occurred on the periphery of this world). Forget any notion of great responsibility: Billy and Freddy experiment with these new powers in ways that only teenagers would, using them to buy beer, get their own back on bullies and shoot content for YouTube. There’s a wide-eyed sense of fun that runs through the entirety of Shazam!. Even as the stakes begin to elevate, director David F. Sandberg (Lights Out, Annabelle: Creation) makes sure that the humour never gets lost in the mix, and the scale remains manageable. Most of the laughs are sourced directly from Zachary Levi, superb as Billy’s adult superhero avatar. With seemingly inexhaustible enthusiasm, he relentlessly channels the energy of a supercharged teen boy. Expect Shazam! to do for Levi what Guardians did for Chris Pratt: magically transform him from likeable sitcom star to sought-after blockbuster lead. But for all the laughs – and they are consistent – the other ace up Shazam!’s golden-gauntleted sleeves is its heart. From the off, Asher Angel is a very appealing Billy, ensuring you root for him, even when he makes life difficult for his adorable foster parents. That warmth extends to Billy’s entire foster family, a smartly cast bunch of endearing oddballs that click together like cogs. Grazer, previously seen in It movie, deserves a special nod, managing to do justice to Freddy’s disability and personal setbacks without making them his defining characteristics. Throughout, Sandberg conjures an affectionate vibe, without ever risking a slide into diabetes-inducing sugar levels. The tone is spot on, and there’s even room for a genuinely emotional gut punch that’ll have you sniffling into your popcorn; even if you question its logic, it’s undeniably affecting. While age-jump body-swap classic Big is clearly a reference point, Shazam! feels like it could’ve been made in the ’80s, boasting an Amblin-esque spirit and the rewatchability factor of your favourite VHS tapes. Finding fault with a film that’s so damn easy to like is tricky. If you’re picking holes, you could say that Thaddeus isn’t likely to be remembered as a great comic-book baddie for the ages, even though the ever-dependable Strong does imbue him with suitable levels of menace. Occasionally the CGI figures look a little below the par you’ve come to expect from high-end blockbusters, and in a month when Marvel is set to release the highest-stakes superhero movie ever, for some the scale might be /too/ small. Plus, the fact that it’s modest in scope and loaded with familiar reference points means that it doesn’t feel as mind-blowing or revolutionary as something like Spider-Man: Into the Spider-Verse. And, if you really want to split hairs, the Christmas setting feels at odds with the spring release date. But, these are all minor quibbles when it comes to the bottled-lightning joyfulness of a standalone superhero movie with likeability and laughs to spare. Following the box-office smash of Aquaman, Shazam! puts the DCEU in a position of rude health, and this is probably its best film yet (sorry, Wonder Woman). In a word: magic. Will Shazam! make it onto our best superhero movies of all time list? Perhaps, but for now, check out the most anticipated upcoming movies of 2019.